The future Academy Award® winner made her movie debut at 16 years old as the pouffy-haired star of this action/comedy about a cache of stolen walkie-talkies, three BMX-riding friends, and the ruthless bank robbers who will pursue them through every graveyard, shopping mall, construction site and waterpark in New South Wales, Australia. 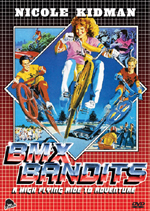 It’s a high-flying ride to adventure filled with wild stunts, cool BMX outfits, creepy innuendo, cheezy synth music, an obnoxious fat kid, and gobs of fast & furious fun. John Ley (Mad Max), David Argue (Razorback) and Bryan Marshall (The Long Good Friday) co-star – with thrilling cinematography from future Oscar® winner John Seale (The English Patient) – in this Down Under ‘80s cult classic from ‘Ozsploitation’ master Brian Trenchard-Smith, the legendary director of Turkey Shoot, Dead End Drive-In and Stunt Rock!